Paramahansa Yogananda will forever remain one of India’s truly immortalized spiritual figures. From the time of his birth in 1893 until his death in 1952, the celebrated sage touched the lives of millions with his unquestionable thirst for God, peaceful demeanor and timeless teachings. In addition to brining the ancient path of Kriya Yoga to America in 1920, Yogananda is responsible for writing one of history’s truly great spiritual classics, Autobiography of a Yogi. Unlike any other theology in the world, an incomparable spiritual mysticism permeates throughout the world’s oldest religion of Hinduism. While ancient scriptures such as the Vedas and teachings on topics such as Brahman and Atman are assuredly infused with a sense of divine wonder, many of the clearest examples of the religion’s transcending enchantment come in the form of life-stories from Hinduism’s great saints and seers. Undeniably, due to a variety of perplexing events and direct revelations from God, the life of Paramahansa Yogananda consummately illustrates this truth. Before he had even reached his first birthday, it was prophesied that Yogananda, who was given the birth-name Mukunda Lal Ghosh, would play an important generational role in spreading ancient Hindu wisdom. After his birth on January 5th, 1893, Yogananda’s devoutly spiritual parents brought their newly born child to receive blessings from their celebrated guru Lahiri Mahasaya, and during this encounter, Mahasaya told the young boy’s mom, “Little mother, thy son will be a yogi. As a spiritual engine, he will carry many souls to God’s kingdom.” Because his parents had such an unshakable conviction in the word of their guru, it wasn’t surprising for them to see their son display unusually high levels of consciousness and a fanatical interest in spirituality throughout his youth. Although Paramahansa Yogananda had to deal with the tragic passing of his mother when he was only 11-years-old, his faith in God and belief in his devotional purpose never wained. During his adolescent years, Yogananda would seek out the wisdom of numerous Hindu sadhus and sages with the ultimate goal of finding a particular guru who regularly appeared in his visions. It wasn’t until he was shopping in a market when he was 17-years-old, however, when he heard a voice tell him to turn around before his guru appearing. For both Swami Sri Yukteswar Giri and Yogananda, there was little doubt that this wasn’t a coincidental encounter. In Yogananda spiritual classic Autobiography of a Yogi, he writes, “This was not the first sun to find me at these holy feet.” Yukteswar additionally told Yogananda during this first meeting, and numerous times after, that he was sent to him by another great Hindu sage and that Yogananda was destined to take the ancient practice of Kriya Yoga to the western world. For the next ten years, Paramahansa Yogananda vigorously studied under his stern teacher who aimed to simultaneously open his pupil’s eyes to ancient Hindu wisdom while also destroying his ego. Moreover, it was during these ten years when Yogananda studied traditional university curriculum at Serampore College, formally joined the monastic Swami order and founded the Yogoda Satsanga Society of India which was created with hopes of teaching spiritual practices along with modern educational courses to young Indian boys. It was at the age of 27, in 1920, while Yogananda was meditating in his school when he had a divine vision telling him that now was the time he needed to go teach Kriya Yoga in America. Although he had questioned his Guru’s vision for his future up until this point, Yogananda now understood that taking the wisdom of Hinduism to the western world was in fact part of God’s plan. After immediately departing his school in Ranchi for Calcutta, Yogananda waited only one day before being asked to serve as India’s delegate for the International Congress of Religious Leaders assembly that was being held in Boston. For the young Swami, the departure marked the start of a 15 year voyage into uncharted American waters. As he traveled across the country, Paramahansa Yogananda left the leadership of the Self-Realization Fellowship headquarters in the hands of a childhood friend who had also traveled to America, Swami Giri Dhirananda. This, however, turned out to be a mistake for Yogananda and the Fellowship program as Dhirananda was caught giving private instructions to a married woman, which led to the Kriya Yoga movement being rocked by scandal. With much of his work shamed by the actions of Dhirananda, Yogananda began desiring to go back to the God-obsessed lands of India, and in 1935, 15 years after first leaving for America, he did return home to a royal greeting. Over the course of the next year in India, however, his stay came with its own ups and downs. It was during this time when he taught Mahatma Gandhi the path of Kriya Yoga, but also when his beloved guru, Swami Yukteswar, passed away. Even though he never planned on returning to the United States, Paramahansa Yogananda did just that in 1936. It was because of Yukteswar’s passing, and also because the start of World War II was looming, that Yogananda came to belief his presence would be more useful in America. His western disciples warmly welcomed the return of their spiritual leader with the gift of a seaside hermitage. Over the remaining 14 years of his life, Yogananda and his closest devotees spent much of their time here and largely kept out of the public eye. It was during this time when the great mystic wrote his now legendary book Autobiography of a Yogi, which has since sold over four million copies. Just as Paramahansa Yogananda radiated a distinguishable spiritual mysticism as a young boy, so to did he at the time of his death in 1952. It was only five years after India gained independence from the British Raj, when Yogananda was asked to speak at a banquet honoring the Ambassador of a now free India. It is said that Yogananda previously told his close associates that he hoped to die speaking about his India and his America, and before the event, he told one of his loyal disciples, “You know it will only be a couple hours before I am gone.” As Yogananda delivered his speech that night, he passionately said, “Where Ganges, woods, Himalayan caves, and men dream God- I am hallowed; my body touched that sod,” before collapsing to the ground. Western medical professionals later said that he passed away from a heart attack, but Hindu mystics believed that he entered Mahasamadhi or consciously and intentionally left his body to join God. Parmahansa Yogananda’s legacy will forever live on in his writings and his Self-Realization Fellowship program. The mystical Swami, as much as anyone, should be credited for bringing yoga and meditation to the western world. His book Autobiography of a Yogi is for good reason considered one of the most important spiritual books ever published. For these contributions and others, Paramahansa Yogananda will forever be remembered as one of Hinduism’s truly immortalized sages. Paramahansa Yogananda went to great lengths to show both his loyal followers and unfamiliar audiences that there is only one universal religion. The great sage fervently debated that because humans remain ignorant to the universal oneness of the world and the internal essence we all share, they remain unable to see beyond illusionary religious differences and divides. He told us, “The followers of every religion like to claim uniqueness for their own beliefs. Their claims, however, stems from human misunderstanding and ignorance. Everyone likes to claim that his own possessions, too, are the best!” Additionally, to truly comprehend the one true religion, he told us that we must move away from external aims in favor of spiritual practices, with the goal of coming to realize our truest-selves. In the eyes of Yogananda, once an individual achieved self-realization, by resolutely peering within themselves, the one universal religion will be clearly seen. “A person may be Christian or Jewish, Buddhist or Hindu, Muslim or Zoroastrian; he may proclaim that Jesus Christ is the only way, or Buddha, or Mohammed. He may insist that this ritual, or that place of worship, bestows salvation. But it all comes down to what he is, in himself,” he told us. To gain insight into the one universal religion that Paramahansa Yogananda talked about, and to continuously live with unwavering levels of joy, the great sage told us that we need to both focus on achieving self-realization and letting go of our attachments to worldly aims. To do this, Yogananda told us to take the path of meditation because it allows us to get in touch with God and see beyond the external illusions we falsely think bring us happiness. “Meditate regularly, and you will find a joy inside that is real. You will then have something you can compare to sense pleasures. That comparison will automatically make you want to forsake your sorrow-producing bad habits. The best way to overcome temptation is to have something more fulfilling to compare it with,” He said. 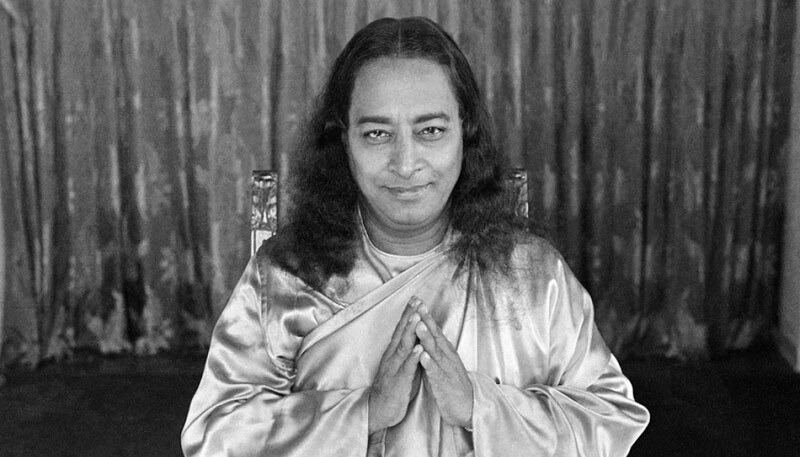 While there are a wide variety of different meditation techniques that one can benefit from, Yogananda championed the meditative practices found within the framework of Kriya Yoga. Fortunately, although he passed away in 1952, Yogananda’s teachings on meditation remain accessible by way of his Self-Realization Fellowship program that still operates today. Yet still, regardless of if you choose to follow the path of Kriya Yoga or meditate with a different technique, it’ll forever remain important to heed the advice of the immortalized Swami. “Even though you may be able to do everything else but meditate, you will never find joy to equal that which comes when the thoughts are silent and your mind is tuned to the peace of God,” he told us.